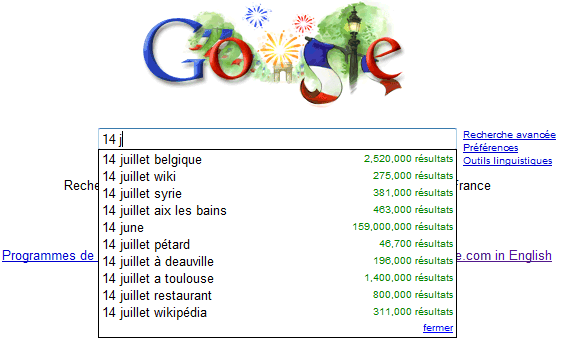 Google France's homepage tests a query suggestion feature based on Google Suggest. The feature seems to be enabled only for the homepage and there's a setting that lets you disable it. In March, other people noticed Google Suggest enabled by default at Google.com. Similar suggestion features are already available at Yahoo and Ask.com. Yahoo's suggestion feature called Search Assistant is more advanced as it displays popular queries that contain your keywords, not just queries that start with your text. It's available in Google Taiwan (http://www.google.com.tw/) too. Its in my google IG page. Do you guys think its a good feature ? Probably. But can you "not" use it if you want too ? I mean isnt it changing the way of thinking (using google). Does it manipulate the way you find stuff ? Iam using it myself, i like how it speeds up my search. But maybe you loose many things not shown in the first 10 suggestions. Nobody forces you to choose one of the suggested queries. You can simply ignore the suggestions and continue to type your query. There's also an option to disable the feature. Andy Roberts suggests in an interesting video that this might change the way people search, but I don't think it will be a dramatic shift.